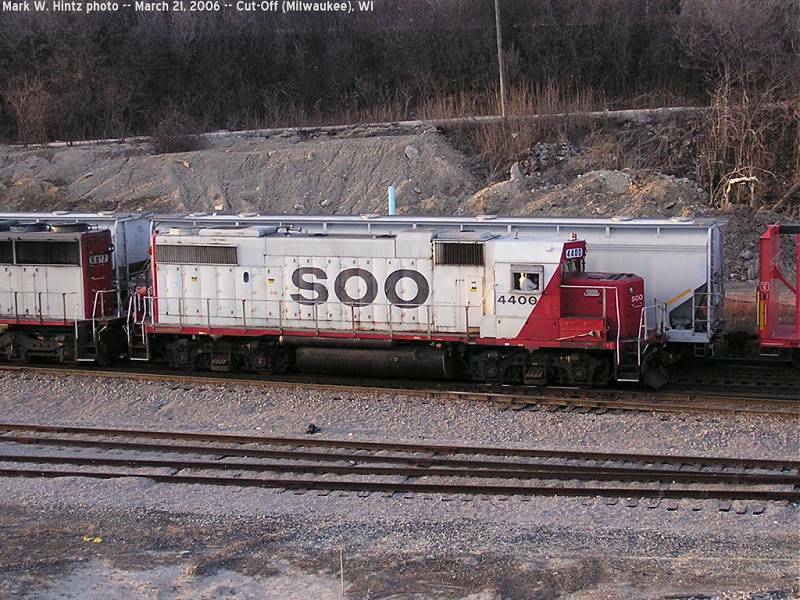 The most common "switcher" used in Canadian Pacific's Soo Line (ex-Milwaukee Road) Muskego Yard in Milwaukee is the EMD GP38-2, numbered in the SOO/CP 4400, 4506, or 4520 series. Sure, some of the MP15ACs and GP40s also switch the yard, and occasionally a CP 3000 (GP38/GP38-2) will show up, but by far it is much more common that one of the SOO GP38-2s will be found down there. They also make occasional appearances on road trains as well, and also some of the local jobs. SOO bought 53 GP38-2s in eight orders beginning in 1977 and ending in 1983, with two of the engines meeting their demise in wrecks (including 4408's wreck pictured here courtesy of Ted Ellis). As a side note, SOO 4400-4409 were originally numbered 790-799, but were renumbered when more GP38-2s came on line. MILW bought 16 GP38-2s numbered 350-365 in two orders in 1973-74, which became SOO 4500-4515 in the 1985 merger. The first six units were turned back at the end of their lease, with five of them making their homes on Kansas City Southern (KCS 4024-4028) and the sixth going to Southeast Coal, then Chicago & North Western. And in 2005, CP received 7 GP38-2's from National Railway Equipment -- actually rebuilt to GP38-2 specs from 4 GP40X's, 1 GP50 and 2 GP38s -- and numbered them into the 4520-4526 number series. These locomotives are also featured here, since they "fit" into the SOO numbering scheme. In December 2008, 4520 met its demise in a wreck at Dresbach, MN (link to photo^), so the NRE '38s are down to six.